Suddenly, I have one swap to do – Pinwheels, podcast done, house good, things going well (generally). So it feels like virtual freedom. 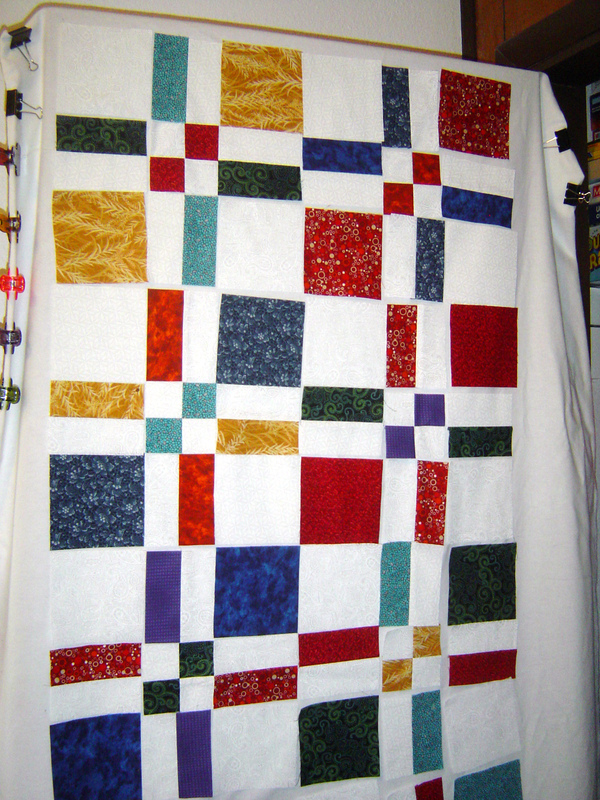 The lack of quilt show deadline looming over my head actually has found me in a state of “well, now what do I do?”. Which is almost comical, when I list out the UFO’s that I have to work on, several of which incredibly excite me. I had promised Nonnie, from Nonnie’s Quilting Dreams that I would get her some blocks for her massive charity quilt project. So I took her up on it and finally set down to sew together several blocks, now they’re just waiting to be mailed (tomorrow). These are pictures of other Four Patches, hers are already in the envelope before I got out the camera. And, because of her talking about the Disappearing Four Patch Blocks, I just HAD to try them, I just HAD to. Even though I only made the requested Four patch for Nonnie as requested, I couldn’t help but make some disappearing four patch blocks on my own. Here is a murdered four patch. Even after sewing them together I liked the look of 4.5 inches, the middles are small, but not TOO small. The more distance between you and the cut, the skinnier the strips (FYI). 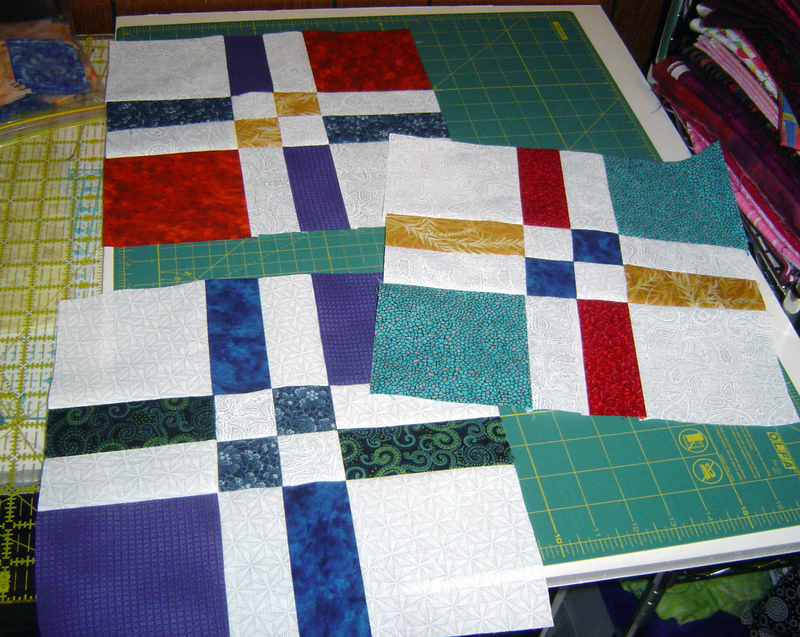 I made 9 different blocks, and decided instead of changing out two colors, I thought I would investigate a bright scrappy quilt, by first lining up all my pieces. 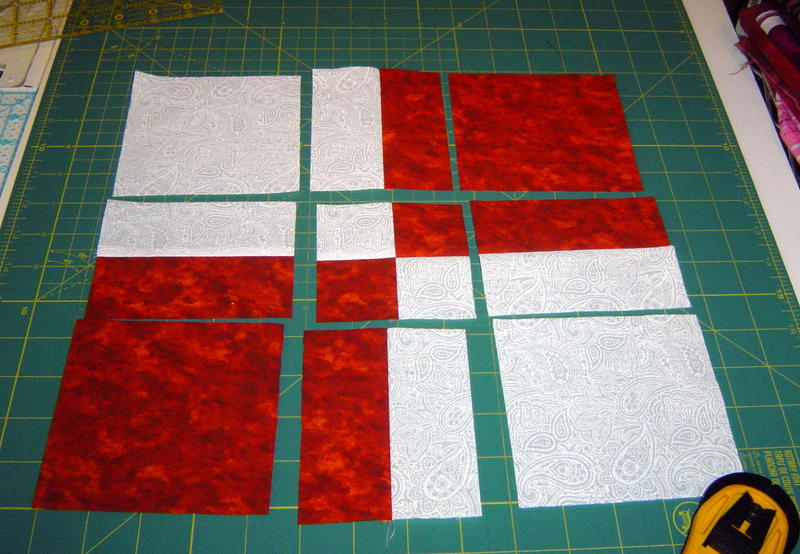 And now 3 blocks are sewn together. New life Frankensteined from nine separate blocks, stitched together lovingly, and fairly quickly. Overall, so far, good experimental technique, and it’s fun, and I am learning to play a little bit! 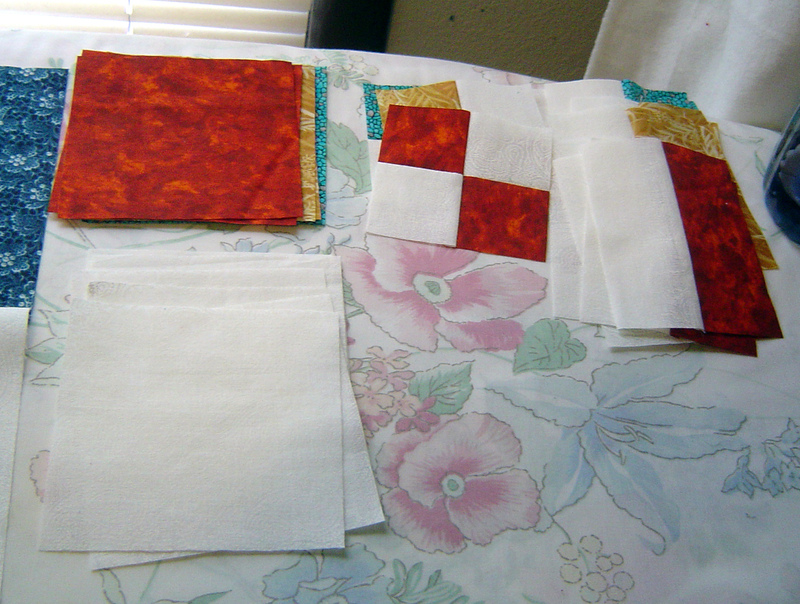 Here is Nonnie’s directions to the charity quilt request, (just 4 patches) and here is Nonnie’s directions on how to do disappearing four patch blocks. Or D4P? Darla, this is really beautiful! Keep playing! It looks great! I have never heard of a disappearing four patch before so was eagerly scrolling through your to find out what one looks like. Love the blocks D4P… my kind of colors. Thank you for sending blocks for the charity quilting.. I will find a great place for them. 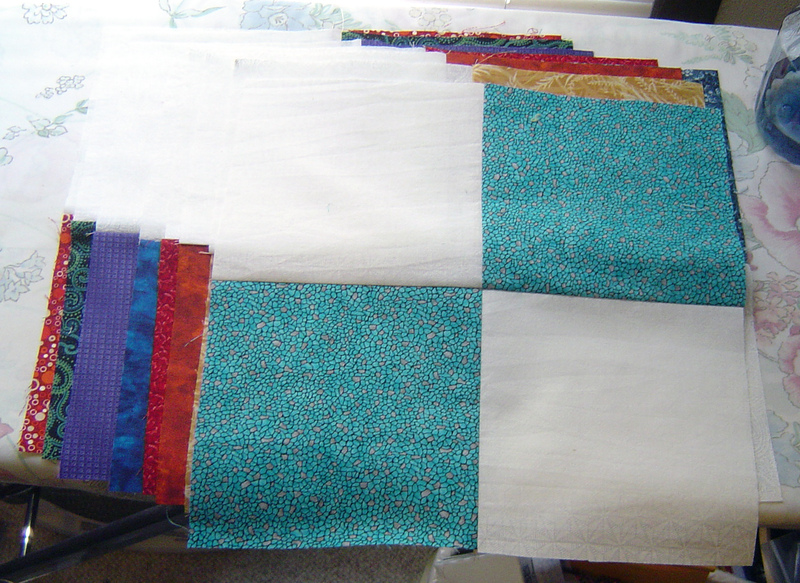 Just so you know the reason I squared up my blocks was because many of them were made by different sewers some of them very new to sewing … I taught a troop of girl scouts how to make blocks so the sizes varied a lot. I squared them all up to 12 inches as that was the easiest. If you get consistent blocks there is no need to square them up . I probably should have made that clearer in my directions. I played around with cutting the blocks centers different sizes. I liked the larger centers best. I loved the way you mixed up the colors in the centers among the blocks you made. It really kicks up the blocks a notch. I might have to try doing it during our sewing sessions. Love the whole idea. Thanks again for the blocks you are sending, I will find a great quilt to put them. The response from internet was fantastic and the kids will enjoy some great quilts. Wow, those are really pretty. Have fun playing.